Oliver Heritage is the magazine for enthusiasts of all things Oliver, White, and Cletrac. From James Oliver's first chilled plow to the White Field Boss, Oliver Heritage brings you the history of the people and the machines of the Oliver family of companies. 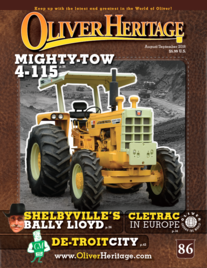 Every two months Oliver Heritage presents technical articles, history, personal stories, and tractor and machinery reviews in a beautiful full color magazine.